A.P Govt. released R.C No 433. As per R.C No 433, the subject is SCERT Andhra Pradesh - School Education - “ Needs analysis for the English Language Teachers as well as English medium Teachers” in coordination with British Council, South India - Conduct of APTIS Test on 5th March at Kadapa and on 7lh March, at Srikakulam East Godavari, Chittoor and Guntur from 1pm to 4 pm - Orders- issued- Reg. 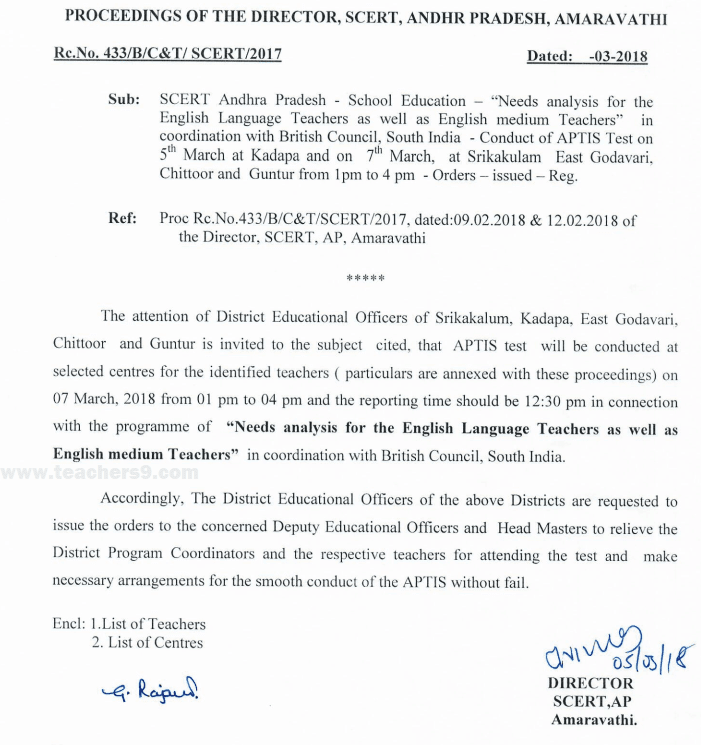 The attention of District Educational Officers of Srikakalum, Kadapa, East Godavari, Chittoor and Guntur is invited to the subject cited, that APTIS test will be conducted at selected centres for the identified teachers ( particulars are annexed with these proceedings) on 07 March, 2018 from 01 pm to 04 pm and the reporting time should be 12:30 pm in connection with the programme of “ Needs analysis for the English Language Teachers as well as English medium Teachers” in coordination with British Council, South India. Accordingly, The District Educational Officers of the above Districts are requested to issue the orders to the concerned Deputy Educational Officers and Head Masters to relieve the District Program Coordinators and the respective teachers for attending the test and make necessary arrangements for the smooth conduct of the APTIS without fail.